If repair & maintenance expenses resulted into the immovable property than input credit is not available. If Telephone, Mobile & Internet bill is in the name of the company and address and place of business is mentioned then only one should claim the input credit. Input credit is available fully. However, if it is sold/disposed of/ scrapped/ thrown away within 5 years, then input credit @ 5% per quarter is available for the used period and balance is to be reversed for not used fully at the time of the date of sale. Input credit is available only if goods & services are used for business. If good or services are used for personal purpose then input credit is not available. If goods & services are used partially for personal use and partially for business use then input credit is available partly in proportion to business use. Input credit is not available if the outward supply of goods or services is exempt from payment of tax. As per Notification No 8/2017 dated 28/06/17, it is provided that if the aggregate value of goods or services or both debited to Trading A/c or expenses debited to Profit & Loss A/c or purchase of any asset obtained from unregistered suppliers is less than Rs.5000/- in a day, then tax is not required to be paid for such inward supplies by the recipient for that particular day. required to be paid for such inward supplies by the recipient for that particular day. 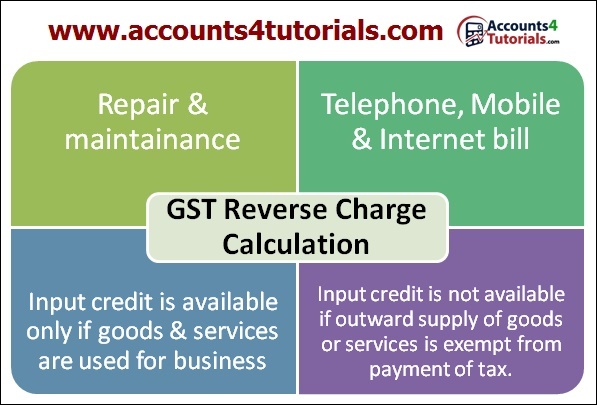 Details of all purchase of goods or services debited to Trading A/c or purchase of any fixed asset are required to be submitted in GST return whether purchased from the registered person or unregistered person or from composition dealer. However, if any expense items are purchased from an unregistered supplier & escape the payment of tax in view of Notification No.8/2017 dated 28/06/17 then same are not required to be submitted in GST return.